The Nikon Coolpix 990 digital camera used with an Orion Telescopes & Binoculars ShortTube achromatic 80mm aperture rich-field refractor. The refractor has a f/5 focal ratio and a 400 mm focal length. A Dasiy model 809 Electronic Point Sight is used as a 1X reflex sight finder. It is mounted on the Orion finder bracket. Also, a JMI Motofocus is used to focus the refractor. The ShortTube refractor is mounted on a Orion Telescopes & Binoculars SkyView Deluxe EQ equatorial mount using an aluminum bar. The aluminum bar also supports the afocal camera assembly using an Edmund Industrial Optics 48mm Barrel T-mount Split ring mount (K52-304) and an Edmund Industrial Optics 2 inch Stainless Steel Mounting Post (K36-495). 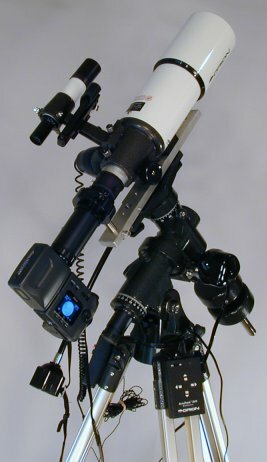 The Orion Telescopes & Binoculars AccuTrack SVD Dual -Axis drive system (#7815) is used on the SkyView Deluxe EQ equatorial mount to track the sky. For Sun imaging an Orion Telescopes & Binoculars full-apertuare glass solar filter (#7706) is used on the ShortTube achromatic 80mm aperture rich-field refractor. Afocal coupling of the Nikon Coolpix 990 to the telescope uses a 28mm to T-mount Adapter from CKC Power, Orion Universal Camera adaptor (#5268), and two Edmund Industrial Optics 48mm Barrel T-mount extension tubes (K52-295 25mm and K53-231 20mm). A 20mm Orion Telescopes & Binoculars Sirius Plossel eyepiece is used in the Universal Camera adaptor. The Nikon Coolpix 990 and Universal Camera adaptor are held ridged with Edmund Industrial Optics 48mm Barrel T-mount Split ring mount (K52-304) and an Edmund Industrial Optics 2 inch Stainless Steel Mounting Post (K36-495). The optical overall effective focal length is 2223 mm. 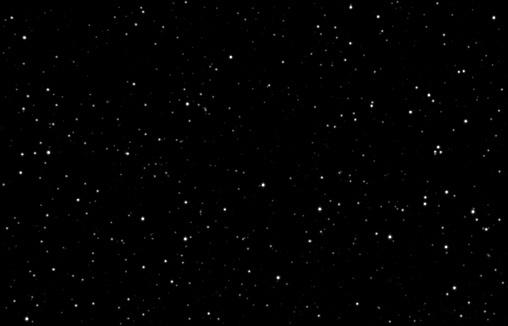 The f-ratio is 27.8, but I am not sure since I stopped down the Coolpix to a f-ratio of 11.1 to reduce the affects of chromatic aberrations when used with this fast focal ratio achromatic refractor.